There’s something very comforting about experiencing silence with strangers. James Berlyn’s one-on-one performance piece, yourseven, celebrates this unusual form of communion, as well as other unlikely delights such as Elizabethan endearments, yarn and the pleasure of being wrapped in a blanket. There’s comfort here, but not without quirks of embarrassment. Yourseven was initially developed by Performing Lines WA in 2014 but this is the first time it’s been staged. 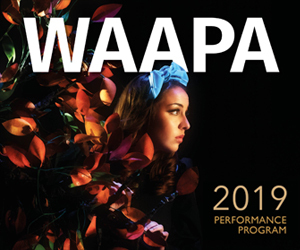 For its world premiere, the actors are from WA Youth Theatre and the venue is PICA. Audience members are led in one at a time, at five minute intervals, to experience their seven stages of life, as described by Shakespeare in As You Like It. Berlyn challenges this concept from the get-go, questioning the number and character of these stages, as well as the inherent maleness of life as defined by the bard. Participatory one-on-one theatre is not for the faint of heart. My companion for the evening was thoroughly relieved to hear that she would not be required to speak. Dance yes, but not speak. We begin by donning headphones, through which we hear some bonny Elizabethan baroque that becomes the soundtrack to our experience. PICA’s performance space has been cleverly converted into a maze of canvas-covered cubicles, each the site of a life phase. Led by a single actor from one darkened cubicle to the next, we are compelled to reflect upon birth, schooling, loving, fighting, adulthood, ageing and death. There’s a guide for each experience, but the young actors act more as our shepherds than coaches – yourseven is only as rewarding as the personal energy you are willing to expend on it. The stages are almost painfully brief – five minutes apiece – so rather than try and aim for an especially accurate representation of each phase, Berlyn opts for a more playful, snapshot approach. In each of the seven cubicles, you participate in an exercise that aims to capture an essence of your own experience of life’s seven stages. These range from activities as passive as being wrapped in a blanket to dancing to a song you fell in love to. Each of these is recorded in a Polaroid image, sometimes taken by yourself, sometimes by your accompanying actor. These are compiled in a photo album that is given to you at the conclusion of your experience. It’s cute, but it’s not representative. This makes for a very different experience than comparable one-on-one participatory art experiences. Berlyn was one of the co-founders of the Proximity Festival – the popular biannual art event wherein participants join artists in the throes of creation. But while those experiences feel like a joint craft, where you are actively engaged by someone who definitely knows what they are doing, yourseven is more of a create-your-own-adventure experience. For the bold, this turns out to be a rewarding, surprisingly emotional journey; while for those not as well versed in the intimate nature of one-on-one performance, it can be confronting or even awkward. Regardless of how enthusiastically you embrace the concept though, there is something intoxicating about existing in a confessional space. To divulge your secret self-perceptions to a stranger feels wonderfully self-indulgent. It was interesting to reflect on how less thrilling this experience might be for the actors, all of whom have grown up in the age of Instagram. Personal divulgence is their currency; naval-gazing a far more natural mode of being. For someone of my vintage it still feels mildly transgressive to impart such intimate knowledge. Does family weigh me down or lift me up? Have I poured more energy into adventures or into career? Who do I fight and why? Part therapy session, part solipsistic adventure, yourseven is a compelling and surprising way to spend an hour. Yourseven plays at PICA until Febraury 17th.